Kiwifruit is otherwise known as kiwi or a chinese gooseberry and is the edible berry of a woody vine in the genus Actinidia. It has a soft texture and a sweet but unique flavour with a fibrous, dull green-brown skin and brigh green flesh. So can chinchillas eat kiwifruit at all? Lets take a look here and its nutritional data and find out more about it. In particular we are interested in its sugar, calcium, phosphorus, fat, and acidic content. 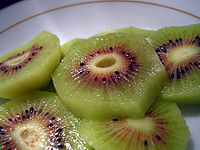 As you can see kiwifruit is quite sweet and contains quite a bit of acidic content. This means that chinchillas cant eat kiwifruit at all. It is just too much for their tummies to handle and so should be avoided when feeding your chins. Kiwi skin and seeds should be avoided too when feeding chinchillas.